All through this year, we have been tracking the mood and opinions of the general public and those who have registered or are likely to vote, and that has added up to this snapshot of the 2014 electorate, which we’ve boiled down to six facts. 1Even though the unemployment rate has fallen sharply since the 2010 midterm elections and a host of other economic measures have improved significantly, it has not done much to brighten the public’s mood on what it considers to be the most important voting issue. While the economy gets better marks than in the last two elections, that isn’t saying much. Just 21% of Americans rated the economy as excellent or good in a mid-October survey (compared with 13% in September 2012 and 8% in October 2010). And, in this election cycle, fewer Americans expect continued improvement with just 27% believing economic conditions will be better a year from now. 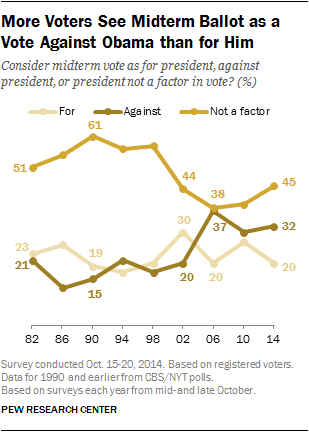 2President Obama is a negative factor for many voters. In our survey last month, 32% of registered voters said they thought of their vote for Congress as a vote against Obama, while 20% saw it as a vote for Obama. The rest said Obama would not be a factor in their decision. Obama has even lost ground among fellow Democrats. About four-in-ten (38%) voters who plan to support the Democratic candidate in the congressional elections said they considered their vote a vote “for” Obama, down from 53% in the 2010 midterms. 4Anti-incumbent sentiment among voters has been growing steadily over the last decade and, this year, it matches or exceeds the last several midterms. 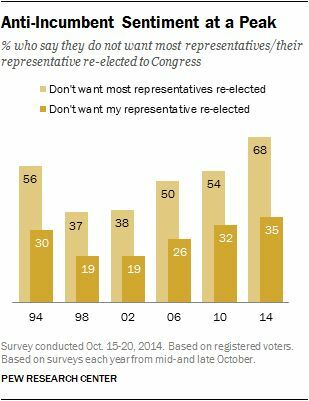 About two-thirds (68%) of registered voters said last month that they don’t want to see most House members re-elected and about a third (35%) don’t want to see their own representative returned to office. In the 2006 and 2010 midterms, about half of voters said they wanted to see most members of Congress defeated. 5Anti-incumbent or not, most voters won’t have a chance to cast a ballot in a competitive race when it comes to the House if history is any guide. Just 29 House candidates in 2012 won by less than 5 percentage points over their closest rival; another 34 won by at least five but fewer than 10 percentage points. Still, that was only 63 races out of 435 House districts, representing around 15% of eligible voters. A Pew Research tabulation of previous elections found that the number of close races — those decided by fewer than 5 percentage points — ranged from a low of 25 in 2008 up to 38 in the Tea Party year of 2010, when Republicans regained control of the House. 6The most likely voters are those who are the most ideological, are highly politically engaged and overwhelmingly partisan. 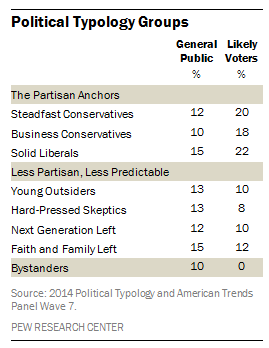 We looked at likely voters through the lens of our Political Typology and our analysis found that the three of eight typology groups most likely to vote were Steadfast Conservatives (staunch critics of government), Business Conservatives (prefer limited government but more moderate on social issues) and Solid Liberals (solidly Democratic).